Insightful analysis by Alan Kohler in The Australian this weekend on what is holding business back and the negative effects on our economy. Sadly, our politicians seem to be disconnected from the reality of how to manage our economy. "A small business tax break is worthwhile perhaps, and likewise an RBA rate cut, and in each case it’s really all the government and the central bank can do." The Government could get involved investing modest sums on alternative finance platforms, like the UK Government did 3 years ago with powerful positive effects (and good returns on investment). That would help overcome people's natural caution and skepticism. People tend to think that banks have some super-natural powers in deciding who is creditworthy. Overseas' experience makes it clear that they are simply expensive, bureaucratic building societies that have lost their way. My father was a bank manager and retired when the computer took away his discretion. Bank managers in his days had real discretion and could support businesses with their growth plans. We need to re-invent banking by going back to why they came into existence in the first place. It had nothing to do with household mortgages which simply inflated the price of unproductive assets. It’s really pretty simple – when you are not paid on time, this can have a huge impact on your business, especially your cash flow. Australian businesses pay up a cringe-worthy 26.4 days late. APRA, in line with global bank regulators, has also told them to increase their capital ratios, and since the system of risk-weighting means that only a quarter of the value of a real estate mortgage is counted against capital versus 100 per cent of a loan secured only against a business, that means all lending these days is more or less confined to mortgages. It means the banks are basically not lending to those who don’t own a house or are already fully committed on their mortgages, and those who are building houses for investors. So they are going elsewhere and paying 10-15 per cent more in interest than the banks would charge, except they’re not. It means the divide between the haves and have-nots (a house, that is) has never been this great, and it’s also why this week’s rate cut by the Reserve Bank will make no difference and why the government’s efforts in the budget to help small businesses and middle income earners will only scratch the surface. 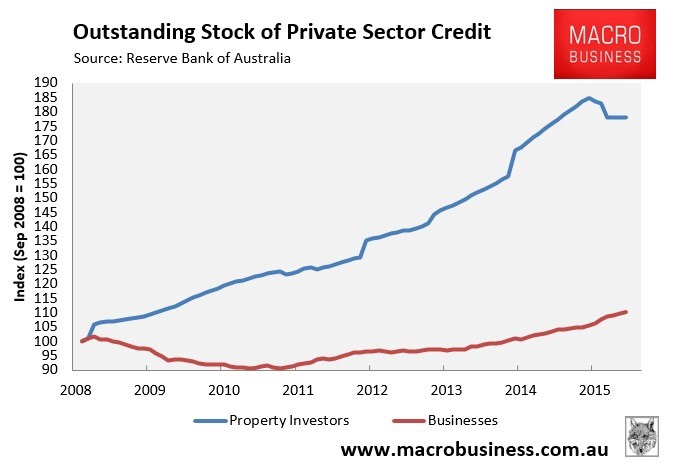 Banks actually run the economy by both creating money and circulating it, not the RBA or the government, and these days banks are only serving those who have equity in real estate. According to economist Saul Eslake, home ownership rates among households headed by people aged 25 to 55 have dropped by an average of 9 per cent since 1991. Most dramatically, the rate of home ownership among 25-34 year olds has fallen from 61 per cent in 1981 to 47 per cent in the latest census. That is a huge social change: in one generation the number of families starting out and having children who also own their own home has dropped from almost two-thirds to less than half, and in the past 10 years the decline is accelerating. It means the number of young people able to get a bank loan to start or expand a business, or to get a car loan or personal loan for anything less than 15 per cent interest, has also fallen significantly. And a lot of that change is caused by the real estate market distortion inherent in negative gearing and the capital gains tax discount, which rewards highly geared property investors at the expense of owner-occupiers, who are in turn paying higher taxes than they otherwise would be in order to fund the subsidy to property investors. So the combination of high house prices caused, in part, by negative gearing and the capital gains discount, with the transformation of banks into little more than building societies that lend almost exclusively against real estate, is the reason growth is weak. A small business tax break is worthwhile perhaps, and likewise an RBA rate cut, and in each case it’s really all the government and the central bank can do. But what’s really crimping entrepreneurship and growth is the post-GFC change to banking. It means business people looking to expand have to come to Shylocks like your correspondent.